Briefly: Book five of the Charley Davidson series continues in the same vein as the predecessors, with Charley needing plenty of coffee, antagonizing her family members, driving Misery and helping ghosts move on. This time, though, someone seems to be trying to kill her as well. And why are there so many females filling up her dad’s restaurant? It’s usually a cop hangout. Plus, someone has purchased the old crumbling asylum where her ghost buddy, Rocket lives and is readying it for a tear-down. And what’s with all of the women that are hanging out in Charley’s apartment? They need to move on, but none will speak to her. What happened? Of course Reyes follows her every move…with pleasure. How’s it going to work with him living next door..especially with that darned arson problem hanging over his head? Didja Like It? : I can’t decide which I love more…the funny quotes under each chapter heading or that Reyes Farrow…(that’s a joke, btdubs)…while those t-shirt and bumper stickers are so awesome that I want Ms. Jones to open an online t-shirt and bumper sticker store, anyone who has caught a glimpse of Mr. Farrow will understand my choice. Anything Else to Mention? : I am happy to say that I think these stories just keep getting better and better. Yes, there is something else going on besides (or in spite of) the Son of Death; some really spectacular storytelling that is full of wit, sarcasm and mystery. The Trifecta. Then, you add in the sexiness of RF…what’s that – a Double Perfecta? 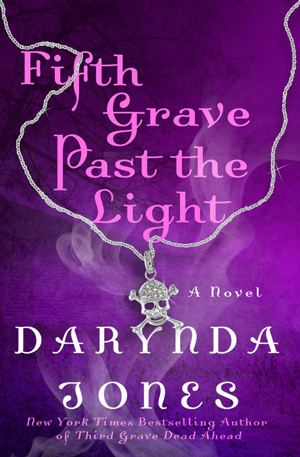 Fifth Grave Past the Light by Darynda Jones was published July 9, 2013 by St. Martin’s Press. Ink and Page picked this book up from the library, so no one had a choice about whether it was reviewed. This was my favorite book in the series to date…just reading your review made me smile!! I liked this one a lot, and the previous one, too. I am glad Reyes is in the flesh and out of prison, and it seems like there is deeper stuff going on around them that adds a little sumthin sumthin to the story.